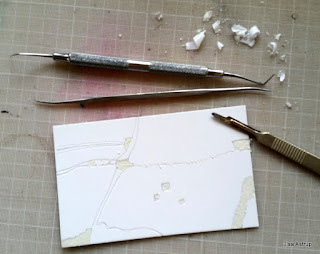 Here I am working on a collagraph printing plate, cutting and making marks and patterns. The next step is to varnish it before the first print. It takes a few steps to make a print plate, so I hope it will be fine. I'll put it on my art site when I'm done, hopefully. here is a print with leaves, it has to be framed later on. 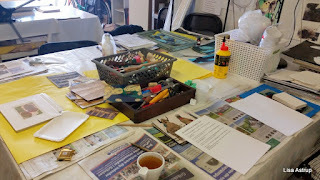 Yesterday I was at a very interesting workshop, it was about collagraph technique. Do you know ATC cards ? Artist trading cards (or ATCs for short) are small, baseball-card sized works of art that can be traded with other artists as a way to get creative, connect with other artists, make contacts, and collect great art! I love that idee, and make and collect myself. 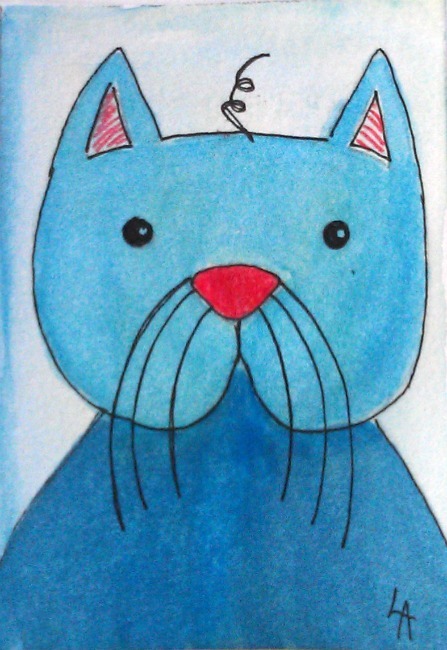 Some cards is called ACEO, ACEO stands for Art Card Originals and Editions. They are cousins of ATC's , both are by definition cards of artwork measuring 2.5 x 3.5 inches, make ACEO cards as well.